After €30-40/ton drops passed on February PS deals, players in Europe are now expecting the market to change direction next month based on the stronger upstream chain and short supplies, particularly for GPPS as per ChemOrbis pricing service. In line with firm expectations for new monomer contracts in the region, PS players foresee that prices may move up between €30-70/ton. 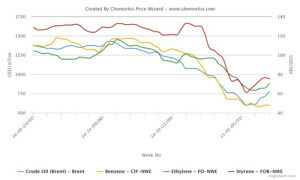 Expectations for March styrene contracts center on €30-50/ton increases amidst higher expected ethylene settlements due to a total rise of €70/ton in spot ethylene compared to early February. 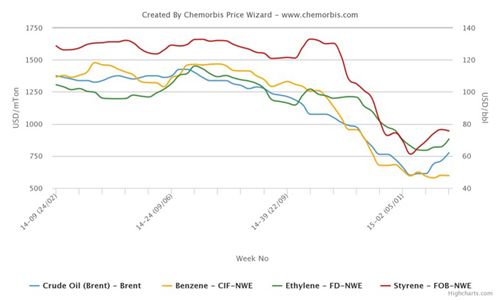 Spot benzene costs gained $20/ton on CIF NWE basis week over week and rose $25/ton since February started. Spot styrene prices held steady on the week while they soared by $60/ton when compared to early February on FOB NWE basis. The main driver behind firmer costs is the energy market, where ICE Brent crude futures rallied almost $6/barrel over the week. In Italy, a packager complained that it is hard to procure material as their suppliers received more enquiries than expected and ran out of material. “Our South European supplier already received orders 1000 tons above their usual volumes. Very limited amounts of Russian and South Korean materials were left by the middle of the month too,” he noted. Another buyer reported paying €50/ton drops for HIPS and €30/ton for GPPS given reduced supplies for this product. Meanwhile, a couple of converters reported having difficulties finding sufficient Egyptian GPPS this month. The Egyptian producer lifted their GPPS prices by $180/ton due to firmer crude and monomer prices by mid-February after issuing drops initially. Their export prices indicate $80-130/ton increases from January. According to ChemOrbis, firm expectations arose in nearby Turkey too as European suppliers are expected to keep their allocations limited to the country for another month. Distributors of two West European producers concurred that they already closed this month due to lack of additional supply from their sources. “We expect around €100/ton hike attempts for March,” one of them said.